The following sample page contains a DatePicker control and two TextBlock controls. 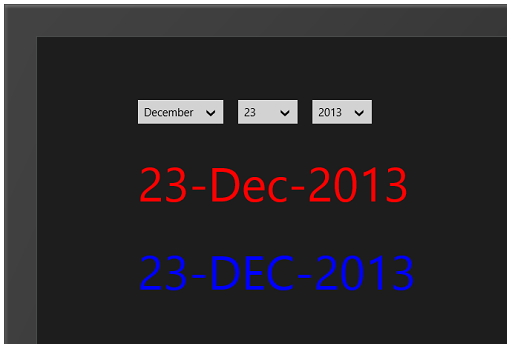 The Text property of the TextBlocks are databound to the Date property of the DatePicker. The first (red) TextBlock uses a FormatConverter to convert the date to dd-MMM-yyyy string. The second (blue) TextBlock uses my ValueConverterGroup to combine a FormatConverter and an UppercaseConverter. The two converters are static resources which are defined in the Page resources. As you can see in the next screenshot the blue TextBlock is showing the date in a dd-MMM-yyyy format in uppercase. The code of the FormatConverter class used in the example. The code of the UppercaseConverter class used in the example. I hope you like my solution. Combining multiple converters is now very easy. You can download my code below. I think it is better to return Windows.UI.Xaml.DependencyProperty.UnsetValue instead of throwing an exception in the ConvertBack method (for performance reasons).